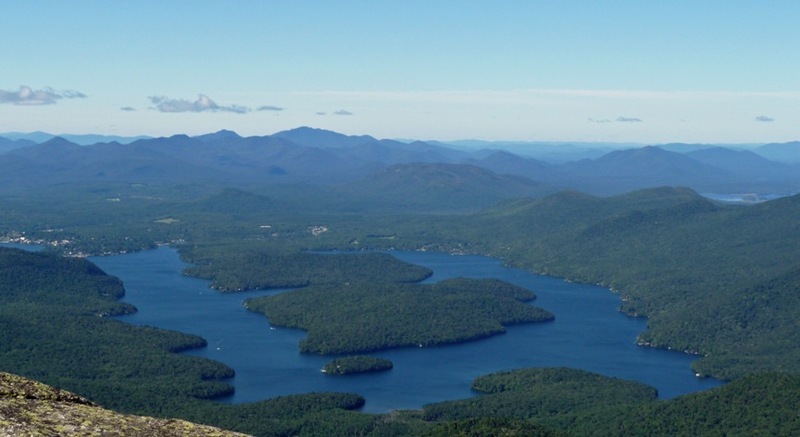 A stop in Lake Placid isn’t complete without seeing the lake from above. It’s an 11 mile hike to the top of Whiteface Mountain, but why hike when you can drive? Although one might expect that some of the proceeds from the $16 admission to the toll road ($10 for car and driver and $6 for each additional passenger) are used for occasional road maintenance, mostly what they seem to be invested in is “Rough Road Next 4 miles” signs. So don’t expect a smooth ride, but it’s still worth the trip. The road ends just shy of the apex, at a parking lot and “Whiteface Mountain Castle.” Built with the granite excavated during construction of the toll road, the castle now houses a café and rest rooms. From there you can reach the summit by two distinct routes: the quarter mile “Stairway Ridge Trail” or an elevator through the center of the mountain. Each has its merits, so plan on doing both. We hiked up the “Ridge Trail,” which winds directly up the north slope of the mountain, mostly over boulders but occasional steps as well. It’s a neat hike with excellent views the whole way. 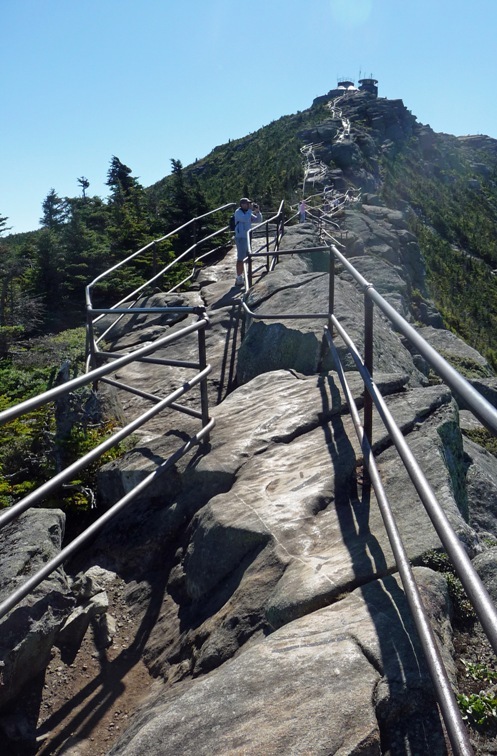 The top of Whiteface provides stunning 360 degree views of the Adirondacks. On a clear day they say you can see all the way to Canada. After our descent, we heard you can even see the dome of St. Josephs in Montreal, which would have nicely linked our last destination with this one. But alas, we didn’t know, and didn’t look (and are somewhat dubious, anyway). For the trip down we rode the elevator, which is an entirely different experience. It descends 276 vertical feet through solid rock, ending in a 424 foot tunnel back out to the parking lot. 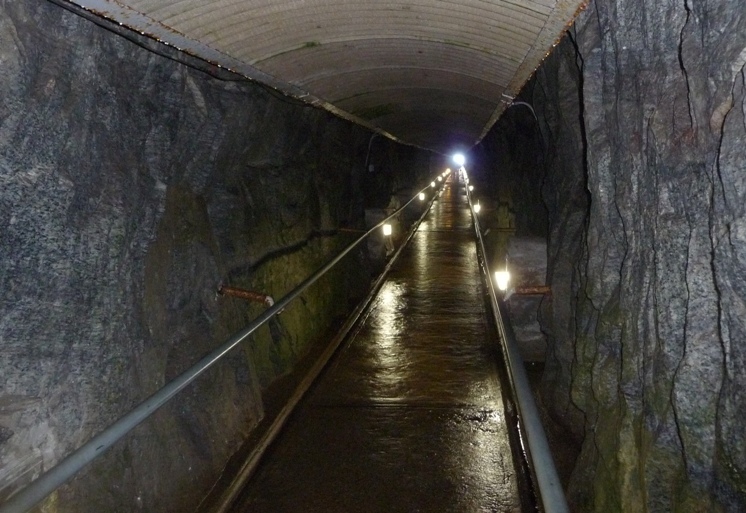 The tunnel stays naturally cool given the superb insulation of the mountain. On our trip through it was a chilly 40ish degrees. But just as the chill began to set in we emerged on the other side; out of the cold and the darkness and back to the sun dappled vista of the Adirondack Mountains.